The intimate moments that precede a wedding ceremony are wonderful. Jen and Broocks had so many personal details that made their wedding unique and so many of their friends had personal touches that added to the special quality of the day….from Laura’s cake, to the necklaces that Jen made everyone, to the engagement photos done by my friend, teacher, and talented photojournalist, Rachel Zahumensky. All of the details were perfect! 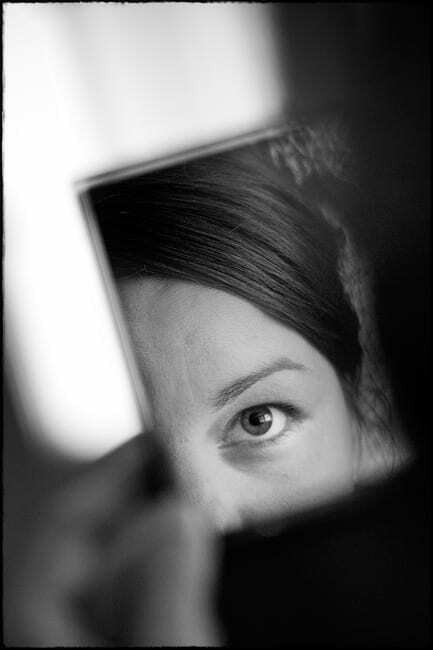 For the “one moment” feature, I have decided to show a close detail of Jen’s eyes looking into the mirror. I love the intimacy that surrounds a bride getting ready and this wedding was no exception. Ash Lawn provided a wonderful setting and the weather could not have been better for a Saturday in July. When a talented artist and photographer asks me to document their wedding, it’s the ultimate compliment. I was so touched when Jen and Broocks wanted me to be a part of their nuptials…..honestly, it almost made me cry. I’ve always respected Jen for her many talents and more importantly, her friendship. To be asked to be a special part of their day simply meant the world to me. Thank you both for your continued kindness, trust, and friendship.